The speedy development of technology meant that our Show-Living Pool on the Biotop premises was no longer state-of-the-art. In keeping with the newest trends, it was therefore refurbished with stone bordering, a dark grey liner and a CombiBox, and now represents our leading role in natural pool construction once more. The changes made to our chamber design brought a technical revolution, as the new polypropylene twin-wall sheets are simultaneously lighter and more stable than the previous solid sheets. The CombiBox was born—a combination of biofilter, phosphate filter and pump chamber. Factory-side prefabrication of these CombiBoxes reduces on-site installation times by up to 70%. These developments together with the good economic situation resulted in a 30% revenue increase for Biotop. 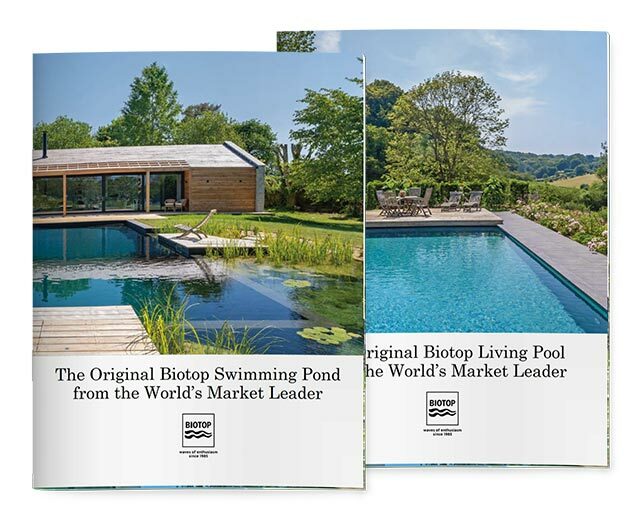 Biotop celebrates its 30 year anniversary, including the publication of a photographic volume featuring the most beautiful pools from three decades on three continents. A total of 5,000 pools have been built together with our partners: A wonderful milestone for a company history spanning 30 years. This year sets the course for an important step in company growth: Expansion to the US. Five US partners join the Group in the first half of the year, in addition to one company from Canada. The 4,000 pools the Group has built to-date translate into roughly ten times the size of St. Peter’s Square in Rome. Retrofitted with the latest equipment, the "old" Natural Pool at company headquarters is now state-of-the-art. The new filter material is used for the first time with very good results. The water quality is perfect. Additional German and French partners join the Group. Spin-off of Biotop’s construction department to form the company T&P Teich und Pool GmbH. Group expansion continues with a partner company in Australia. The Living Pool is introduced to the market. Expansion of the partner network continues. At the beginning of 2011 the network includes 50 partner companies in 17 countries. Patents are granted for the phosphorous filter "PhosTec Ultra" and the "Biotop Living Pool". The business segment "distance planning" gains momentum. The first Natural Pools in India and the US are built. The partner network is expanded to include additional European countries, Turkey, New Zealand and Israel. Biotop introduces three ground breaking innovations to the market with the curved screen skimmer, the submerged pump chamber and the phosphorous filter "PhosTec Ultra". Development of the Living Pool begins. 2006: Biotop is nominated for the Austrian “State Prize for Architecture and Sustainability” for the project “Biotop Offices and Workshops” in Weidling. A nomination for the “Neptune Water Prize” in the category “Water Conservation” for the “Living Pool” follows in 2009. The 1,000th natural pool is built. The Biotop Carbonator makes a break-through in the market. Queries from Italy, France, the Netherlands, Belgium and England encourage Biotop to expand its partnership network into these countries. Planning for a new office building in Weidling begins. 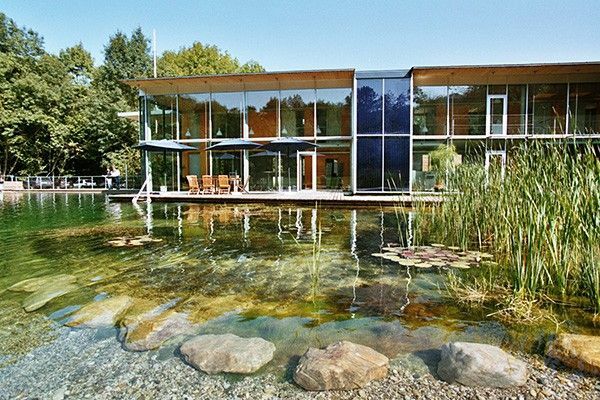 Biotop moves into the new headquarters in 2003, which is opened on June 14th at the 3rd "Natural Pool Open House Day". Biotop and its partner companies build 200 Natural Pools a year. In 2003 Biotop is the recipient of the “Austrian State Tourism Prize” for its project “Mountain Beach Gaschurn”. In 2003 we moved in to our new office building that was nominated for the Austrian State Prize for Architecture. The 400th Natural Pool is completed. Biotop receives numerous awards, among them the "Eco Design Prize 96", a prize for sustainable products and solutions. Additional license partners in northern Germany join the network, which now comprises 22 partner companies. A Natural Pool is built in Chile. An amendment to the Swimming Hygiene Law is passed, providing legal certainty governing the construction of Natural Pools. This culminates in booming business for public Natural Pools. The partner network in Germany now spans the country. The Biotop Carbonator, a product aimed at reducing algae growth, is integrated into the first projects. In 1995 Biotop wins the Innovation Award presented by the Province of Lower Austria and the Lower Austrian Economic Chamber. The first public Natural Pool is built. The 100th Natural Pool is completed. Neighboring countries catch on to the idea of the Natural Pool. Biotop receives a planning contract for a recreational park in Gaschurn/Vorarlberg. Biotop has a staff of 25. The partner network is enlarged to 12 licensees. Five employees build natural pond systems. The idea for natural swimming pools is born. 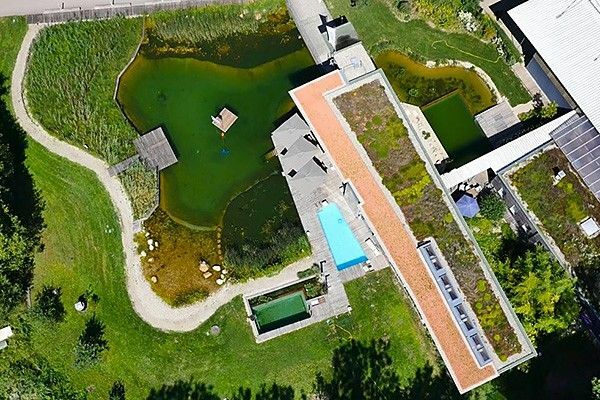 The idea of the "Natural Pool" is awarded the Austrian Prize for Environmental Protection. Interest booms and Biotop becomes the market leader. In 1987 Biotop is chosen for the Austrian overall prizewinner for the Conservation Award given out by the International Conservation Foundation. Biotop is founded. The company name "Biotop" is reminiscent of a natural habitat. Goal: an ecologically oriented company that can also be profitable.